This review assumes a basic understanding of the appropriate technology. Reviewed October 2010 + updates below. We did some research and these licence free PMR two way radios looked promising. Essentially a parallel replacement with a more professional appearance and a (reported) better communication range, we were convinced when we found we could get them for 'free' by using up some loyalty card points. Like our previous talkie walkie radios, the Binatone Action 950 batteries (NiMh cells this time) are recharged by conveniently slotting into a charging 'pod'. Unlike their predecessors no plug-in earphone / mic is supplied (although the MR600 ones work fine). Some new features are present, such as a vibrate call alert, new call ring tones and a (thankfully switch-able) roger beep. On the right. The professionally styled Binatone Action 950 two way radio handset. The first thing we did was to see how far we could communicate using the Binatone Action 950's. We also compared the new two way radios with the old talkies. To do this Belinda sat at home supping wine in the lounge with one old and one new radio set to different channels, while Mike went walkabout (without wine) also armed with one of each. He called up from seven pre-determined points on each talkie in turn and back home Belinda logged the results (and supped some more wine). The terrain was semi-rural, and obstacles included: housing, a railway line, a pub, some shops, a car park, and some green open space. Oh yes, let's not forget the trees and gradually rising then dropping elevation. Oh, and the lounge wall and window! It soon became apparent that the new two way radios were more capable than the old walkie talkies, which started to break-up at around the railway, 1/3rd mile away. The 950's became patchy soon after, but in general communication was still possible right up to point 7 at almost one mile distant, long past point 3 when the old PMR's were last heard. While a mile may not sound too good, especially considering the advertised range of 'up to 6 miles in ideal conditions' we were operating these two way radios in far from ideal conditions. As both walkie talkies are constrained by the regulated PMR licence-free transmit power of ½ watt ERP, we put the improved range down to better aerial efficiency and receiver sensitivity. Now of course this was a far from reliable scientific range test (especially as wine was involved!) but it proved the Binatone Action 950 two way radios did indeed have an improved coms range. As we've found previously, the biggest obstacle to two way radio range is land mass; here we had that getting in the way so not a bad result overall. And did Mike make it back to base? Yes, much later - after he diverted to the pub for a 'swift' half! Apart from the coms range then, what else is better on the Action 950's? Well, for one these talkies can stand upright without falling over (the old ones had a rounded base) and your hand fits snugly round the molded casing. Watch out when standing the radios vertically on metal objects though as the battery charge contacts are flush on the base - could cause some arky-sparky! Remember the CTCSS codes in the original talkie walkie review? The Binatone 950's have CTCSS but also add DCS (Digital Code System) - 85 DCS codes in fact - for extra coms security. And settings allow the radio to scan received transmissions for CTCSS / DCS codes being used. Another useful setting allows two channels only to be scanned (dual watch) in addition to scanning all eight (auto channel scan). We often need to scan channels 2 & 8 when out geocaching. Any not so good points? Yes, a few! Firstly, the Binatone two way radio's rotatory volume/on-off control doesn't have click stops or markings and, with its light touch, it's very easy to inadvertently knock it down with the result no calls are heard. We added a white stripe (there's life after typewriters for correction fluid!) to the knob to determine position. Another gripe with the radio's volume is the lack of it, even turned up full; OK indoors, but not when outside. It would be inaudible in a noisy workshop, building site or even the pub, for instance (so that's why Mike didn't hear Belinda calling when returning from our range test!) Then there's the pointlessly prominent large frequency readout digits on the LCD display; with only eight channels users just don't need to know this - TMI - and it's bound to cause confusion, a large channel number would be far more useful. One last point: although there's a lock to prevent accidental channel/code changes, the lock doesn't work when scanning and it's all too easy for a button to get pressed unknowingly and stopping the scan. These issues are a real shame, particularly when they'd probably been an easy fix at the design stage at negligible cost. Not a lot to report really, the Binatone Action 950 two way radios work just fine still. We've dropped them a few times and they've survived and, like our previous talkie walkies, there's a bit of dust build-up under the perspex display but it's no bother. We've noticed the transmit audio is lower on one talkie and keep meaning to pop the cover off to see if the mic has dislodged (maybe one of the drops?) but haven't yet. And we find the squelch (the circuit that cuts the background hiss under no signal conditions) seems to be set a little too high, causing the received signal to chop out when, although marginal, is still intelligible. If it wasn't for this the usable range of these two way radios would be extended a little. The squelch can be overridden with a press of a couple of buttons, but then the noise roars until cancelled which is a bit of a faff. So maybe another reason to pop the cover off the Binatone Action 950's and get to the guts to see if there's a squelch pre-set on the circuit to tweak. We should add that Mike's background was in electronics and radio communication; don't try this if you're not familiar with micro-electronics! And of course it'll invalidate any warranty still current. In last year's update we were pondering on opening up these two way radios to investigate the low transmit (TX) audio one of the pair was producing. Well, we did and after a bit of internet research identified two 'pots' (that's a technical term for a miniature circuit board adjuster according to Mike; definitely not something he engaged in during his youth!) - one for squelch and other for deviation (yes, another rather technical term that sort of governs the transmit sound). After carefully marking the existing position of these pots, we first twiddled the squelch to allow a weaker signal to be received before noise cut-off. Subsequent testing found that this did indeed increase the range, at the expense of a noisier signal (voice) at the edge of range. However we weren't so lucky with the quiet TX audio. First we cut out some of the foam around the microphone (mic) hole in the radio's case, then drilled out said hole a bit larger, but both showed no improvement. Next we checked for a dry joint on the board, running over some with a soldering iron. Again, no fix. So we twiddled the deviation pot and the only effect was an increase in background noise (deviation isn't really the right area, but it was worth a shot) so we quickly returned it to the position we'd marked. Not to be easily beaten we next figured it might be a duff (now that's not a technical term!) mic insert, so desoldered it and replaced with the one in the unused mic/earphone harness that came with our previous talkie walkies. Arrggh, still no change (it's enough to drive you back to pot)! And so it remains, our conclusion is a faulty component on the circuit board. 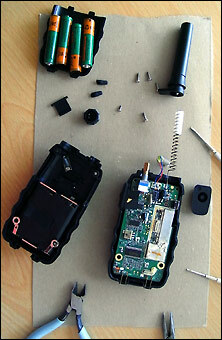 Our two way radio in bits. Can we fix it? Er, no! We've had several enquiries from you guys out there about battery life and how they're holding up. Well, yes, they have noticeably dropped in running time so we've replaced the batteries. The Binatone Action 950's were supplied with 8 AAA rechargeables of only 550mAh capacity and we've now got some high quality branded 1000mAh, after all they're cheap enough. We changed to using a separate charger that stops the charge when fully charged; this avoids over-charging and cooking the batteries, although we lose the convenience of slotting the two way radios into their charging dock. But batteries are now rather academic for us as the unresolved low TX audio on one radio rather render it useless so we're looking for some new ones... Two way radios that is. And we'll probably spend a bit more and get some more robust ones - taking them apart revealed just how down-to-a-price these are made! Well you never know who's lurking, and following our previous Binatone Action 950 update (above) we were soon contacted by one of you genned-up guys out there (thanks Dave, you know who you are). Now Dave suggested a possible cause and cure for our low level TX audio on one of the two way radios - that the channel frequencies may have drifted (as they had on his Action 950) and that there's an adjuster for that. So it was off with the casing of the offending talkie, adjuster identified and a twiddle with a frequency meter attached and... no difference - arrggh! Of course the short soldered speaker wires dropped off again (we fitted longer ones re-routed to minimise strain when we next open up these two way radios, if we ever do). The Binatone Action 950 has now been superseded twice over, first by the Binatone Action 1000 and currently Binatone Action 1100. But don't get too excited - it appears these are cosmetic changes only, with the same radio 'guts' under the hood. So we won't be buying them anytime soon; there's our TX audio problem, but the main reason is that our delving in revealed just how skimpily made these two way radios are. Pending any major developments, this will be our last Binatone Action 950 talkie walkie review update. For the record, this two way radio review page is among the most visited and sees the longest average time-on-page of our site. So... thanks for watching, and goodnight. 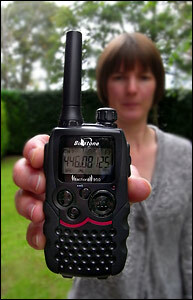 See PMR talkie walkie related website resources and the Binatone website on our earlier review page. © micbinks 2010-2014. Please ask permission if you wish to reproduce any of our content.